The HomeLink® Universal Transceiver can be programmed to operate up to three remote controlled devices around your home, such as garage doors, lighting, or home security systems. Refer to the safety information that comes with your garage door opener to test that the safety features are functioning properly. If you do not have the safety information, contact the manufacturer. Before programming HomeLink, make sure that people and objects are out of the way of the garage or gate to prevent potential injury or damage. When programming a garage door opener, park just outside the garage door’s path. HomeLink® is a registered trademark of Johnson Controls., Inc.
Before programming HomeLink to operate a garage door opener, confirm that the opener has an external entrapment protection system, such as an “electronic eye,” or other safety and reverse stop features. If it does not, HomeLink may not be able to operate it. 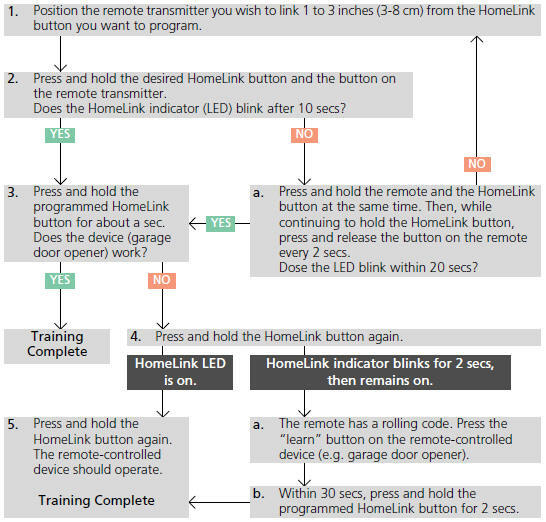 If you have not trained any of the buttons in HomeLink before, you should erase any previously learned codes. 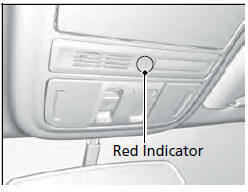 To do this: • Press and hold the two outside buttons for about 20 seconds, until the red indicator blinks. Release the buttons, and proceed to step 1. • If you are training the second or third button, go directly to step 1. To erase all the codes, press and hold the two outside buttons until the HomeLink indicator begins to blink (about 10 to 20 secs). You should erase all codes before selling the vehicle. If you have any problems, see the device’s instructions, visit www.homelink.com, or call HomeLink at 1-800-355-3515.